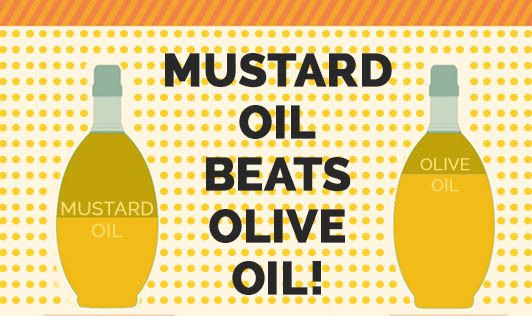 Mustard Oil Beats Olive Oil! Mustard oil is known to us by contradicting reputations in different parts of the world. While in the rest of the world the oil is less popular and believed to be toxic, it is an extremely popular oil in the eastern states of India and Bangladesh. In India, it is used since ancient times and its health benefits are attributed to its inborn properties of being a hair vitalizer, an antifungal agent, antibacterial, appetizer, anti-rheumatic, aphrodisiac and a natural insect repellent. Research has shown that mustard oil has extremely low saturated fatty acids. The fatty acids that are considered to be good for health like MUFA and PUFA is recorded high in mustard oil, beating the records of olive oil. These factors of oil prevent arteries from getting clogged and protect one from heart problems. Renowned cardiologists in India are now comparing the nutritional qualities of mustard oil over olive oil and have derived conclusive evidence about the superiority of mustard oil. Mustard oil is not only packed with omega 3 fatty acids, it is also loaded with antioxidants, essential fatty acids, and vitamins. Another good attribute of mustard oil is that it has high stability and thus, perfect for Indian cooking, especially deep frying. The unique taste of mustard oil also adds a beautiful flavor to food. Moreover, mustard oil is more economical over olive oil. With so many health benefits, mustard oil is soon going to be one among our cooking oils in most of our kitchens!